Environmental Poisoning: How Round UP Herbicide Has Caused A Sudden Rampant Yeast Infection. Gardens and grass verges should never be sprayed with weedkillers such as RoundUp. We are still being exposed to this terrible poison by councils all over the country who spray it around our pathways and parks on a regular basis. There are better, safer methods of weed-control other than using RoundUp. 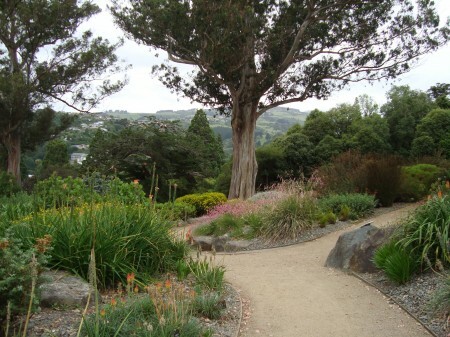 This is a photo of Dunedin Botanic Gardens where, I believe, RoundUp weedkiller is not used. I pray that all councils in New Zealand stop using herbicides around our towns. There are safer alternatives, such as steam, and biodynamic methods, and homeopathic methods, which can be adopted instead. My experience of being subjected to the herbicide RoundUp proves to me that yeast infections are very often the result of environmental poisons on the body. RoundUp weed killer, and other herbicides and insecticides, kill off the beneficial bacteria in the bowel, which means that the candida albicans organism has the opportunity to take over. Environmental poisons such as RoundUp weaken your immune system drastically, starting with the reduction of the ‘good’ bacteria. The whole system can be affected by poisons such as RoundUp, and very quickly too. The whole nervous system suffers from the use of exposure to RoundUp. Your eyesight, bones, blood pressure, skin, digestive system, hearing, and brain can all be affected. Of course, sensitive people, which category includes children, will suffer more than insensitive people. Which is why this deadly poison should NEVER EVER be sprayed around lawns, houses, and streets where children often walk bare-foot. We got no warning that this spraying was about to be done around our houses, but even with a warning we would not have been spared from the damaging effects of this poison. It is exactly a week since the council sprayed the herbicide all around the town, and all around the gardens and paths of our residential complex. A few days after the spraying, I wrote about the immediate effects that this poisoning had had on myself, as well as those which my friend experienced. The Vitamin C megadoses, plus homeopathic remedies, helped enormously during those first few days following the spraying. But a week later, because of recontamination because of walking along the streets each day, and having the RoundUp still lying about our houses with no rain to dilute it, I have become very sick with an attack of candida. Because the digestive system is affected, I now have to avoid using homeopathic remedies, herbs, cooked vegetables, coffee, etc, until the infection subsides. Today, suddenly, the stomach pain became very severe and I felt that I would faint any minute. Dizziness, pain in the head, blurry vision, nerve pain and nervous tremors, heart palpitations, and a racing pulse all manifested as a reaction to the RoundUp in our living environment, which we have had to put up with for a week now. The yeast infection has affected every part of my system and I have had to resume the very strict candida diet, omitting all fruit, grains, potatoes and many other things. I am taking non-acidic vitamin C in large doses – 1000mg-2000mg several times a day – around 8000mg on the first day. I will reduce the dose by about half tomorrow. I also took two 500mg tablets of Paracetamol in one dose, to quickly reduce the symptoms of poisoning. A few hours later, I took just one more Paracetamol, with 1000mg non-acidic vitamin C.
These measures have brought the infection under control. Unless I can persuade the council to stop spraying around our houses, I think I will have to move to a safer place. I have not been exposed to such quantities of herbidice for many years now. This is one hazard of living in a New Zealand country farming community – there is just not the awareness here of the danger of widespread herbicide use, compared to the awareness which is growing in Auckland. The first time they sprayed here was about six weeks ago, shortly after I arrived. The symptoms were the same, with bone pain, dizziness, nausea, etc. But with this second dose of RoundUp poisoning, six weeks later, I am suffering more severely, and the symptoms are longer-lasting. My elderly friend did not realize the council had done any spraying around her house, and went out into her garden as usual. She was barefoot, and waded into the area which the council had sprayed profusely, and which now, a week later, is totally brown and dead from the effects of the spray. My friend got a terrible allergic reaction the next day, with swollen legs which were covered with a very angry-looking red rash. The rash became a little better, but she has been wandering around on the grass near her house, bare-foot, and the rash came back again. I was worried that she might get an infection in the skin, which was beginning to break in parts. At her age, this could have been very dangerous. She eventually went to the doctor to get an antibiotic, just in case septocaemia set in. Note: The above treatment worked to remedy the sudden attack of candidiasis which had resulted from being exposed to the poisonous herbicide ‘Round Up’. At the end of the first day, after powering into those 1000mg tablets of non-acidic Vitamin C, plus two doses of paracetamol, the attack subsided. The following day I took another couple of doses of paracetamol, just one tablet each time, and took around 6 doses of 1000mg vitamin C tablets through the day. I kept away from all fruits, cooked veges, grains, bread, biscuits, yoghurt, etc, which had the effect of starving out the candida. I ate high protein food – that beautiful steak – for two days, by which time the infection was over. On the third day after the attack, I resumed eating a normal healthy diet, with fruit – and coffee too. But I am avoiding yeast foods such as bread, and amping up the high quality protein and fat foods. Now I am meticulously avoiding the areas around the town, and around my house, which have been sprayed with Round Up. If it rains this weekend, the residues on the grass will hopefully be washed away. And, after suffering many distressing symptoms, with much effort put in, and expense too – Vitamin C megadoses are not cheap – I now have recovered from this deluge of Round Up spraying, so my health should be perfect until the council come around to poison us all over again – in around 6 weeks’ time. Herbicides should never be sprayed in public places. 5th July 2013 – Unfortunately it appears as if the council are not going to stop the spray of RoundUp poison around our houses – weedkiller has been sprayed around the town and also about our flats. Yesterday, I smelt the distinctive smell of weedkiller as I walked downtown. It affected my breathing immediately and brought back the flu sumptoms. Today, the weedkiller smell is very strong outside my flat. Best thing is to stay indoors to avoid walking in it and avoid breathing the fumes as much as possible.